If you have spent any amount of time in Canada during the winter then you know first hand how important a reliable furnace can be. Too many Canadians struggle with their old and outdated furnaces – facing breakdowns in the middle of winter and having to put up with uneven heating in the home. In the past decade or so, furnace engineering and technology has grown by leaps and bounds and if your furnace is even 10-12 years old you are probably missing out on the immense benefits of having a modern furnace heat your home. One of the most common complaints that we hear about ageing furnaces is that they are simply unreliable and give the owner more trouble than they are worth. There are a lot of factors that can cause your furnace to stop operating optimally such as lack of regular maintenance, overuse or an improperly sized unit, and just general age and wear and tear. We hear horror stories all the time of customers having to don all their winter gear to stay warm and head down to their basement to tinker with a faulty furnace. That is why at Furnace Rental, we try to make it as simple and affordable as possible for Canadians to never have to deal with this kind of situation again. That is also why we carry only the most reliable and proven brands on the market. 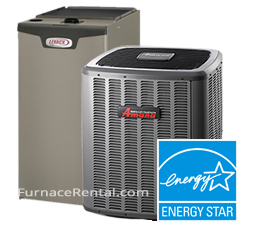 When you rent a furnace from us we guarantee absolute peace of mind. And if there ever is an unexpected breakdown, we’ve got you covered with our priority emergency service. ➤ All of the furnaces we carry are modern and built by the most reputable companies in the world. They are all highly-efficient and highly reliable in the first place. ➤ When you rent from us your unit is 100% covered with our iron-clad service plan. We are on call for you day and night, every day of the year so even if something goes wrong with your unit at 3 in the morning, a certified technician will be there to correct the issue for you ASAP. Imagine never having to worry about your furnace again. Imagine never having to go without the warmth that you and your family deserve (and need!). That is the peace of mind we offer with our incredibly convenient furnace rentals. What Makes Our Propane & Natural Gas Furnaces So Reliable & Efficient? Understand that it is our goal to take as much hassle concerning your furnace off of your hands as possible. With this goal at the forefront of our minds, we began by stocking only the highest quality high-efficiency furnaces on the market today. In addition to gas systems, we also offer propane furnace rentals, for those living in rural areas or regions without natural gas infrastructure. High AFUE Ratings – AFUE stands for Annual Fuel Utilization Efficiency and in a nutshell, this rating gauges how much utility fuel is turned into usable warmth for your home. The higher the AFUE rating the better. For example, say you opt for a furnace with a 96% AFUE rating. That means that only 4% of the fuel being fed to your furnace is being wasted while 96% of it is being put to use. Older furnaces usually have lower AFUE ratings to begin with and even if your furnace does have a good AFUE rating, it can become less efficient over time, especially without proper maintenance. Our ENERGY STAR furnaces operate at up to 98% AFUE which means there’s almost no wasted energy (or money!). Dual Stage Operation – Furnaces don’t always have to operate at full capacity so if you have a single stage furnace, you could be wasting hundreds of dollars a year. We carry dual stage and variable-speed furnaces which operate at a lower energy consumption level when the temperatures are not as cold but still offer powerful heating when needed. Modulating Furnaces – Modulating furnaces take dual stage operation one step further by offering more variety in heating power. The burner output and the blower have varying levels of output so your furnace can constantly adjust to precisely the level of heating power that’s required. What all of these features of our furnaces add up to is superior heating control over your home, huge savings on your utility bills, and even quieter operation. It is really amazing how beneficial modern furnaces can be for your home whether you live in Toronto or Thunder Bay, Regina, Calgary, Edmonton, Ottawa, Hamilton or anywhere in between. Besides the superior heating power, control and comfort that a modern furnace affords there are other benefits to factor into the equation. First of all highly efficient furnaces are better for the environment needing less fuel to operate. The government has recognised the good that these units can do for the country and the environment in general and offer incentives to having them installed inside Canadian homes. We apply for these rebates for you after the installation is done and you receive a cheque in the mail! Furnaces are one of the primary energy-consuming appliances in the average Canadian home, and heating can often be responsible for over half of a home’s annual energy costs. For this reason, upgrading to a new high-efficiency model can lead to huge savings for homeowners. A new furnace can slash heating bills and save homeowners hundreds of dollars annually, even offsetting a large portion of the cost of your new furnace rental. And right now, you can save even more with government rebates. After your new system is installed we apply to them on your behalf so you receive a cheque in the mail without lifting a finger. Ask us for more details! Modern energy-efficient furnaces are far more efficient than models that are even just 10 years old, and are much better at maintaining a consistent temperature without needing to frequently cycle on and off. Newer models also tend to be much quieter and very reliable, lasting longer and requiring fewer repairs. With rentals from respected manufacturers like Goodman, Amana, and Lennox, you get home heating you can count on to keep your family warm through cold Canadian winters. With our rent to own program, upgrading has never been easier or more affordable. So what are you waiting for? A comfortable energy-efficient home is just a quick phone call away!